Colin Kaepernick smiles as he listens to a question from the press as the 49ers attended media day at the Super Dome in New Orleans, La., on Tuesday, January 29, 2013, as part of the Super Bowl festivities. Frank Gore of the San Francisco 49ers answers questions from the media during Super Bowl XLVII Media Day ahead of Super Bowl XLVII at the Mercedes-Benz Superdome on January 29, 2013 in New Orleans, Louisiana. Patrick Willis listens to a question from a reporter as the 49ers attended media day at the Super Dome in New Orleans, La., on Tuesday, January 29, 2013, as part of the Super Bowl festivities. Colin Kaepernick of the San Francisco 49ers answers questions from the media during Super Bowl XLVII Media Day ahead of Super Bowl XLVII at the Mercedes-Benz Superdome on January 29, 2013 in New Orleans, Louisiana. Dashon Goldson of the San Francisco 49ers answers questions from the media during Super Bowl XLVII Media Day ahead of Super Bowl XLVII at the Mercedes-Benz Superdome on January 29, 2013 in New Orleans, Louisiana. San Francisco 49ers quarterback Colin Kaepernick tattoo is seen as he answers reporters questions during media day for the NFL Super Bowl XLVII football game Tuesday, Jan. 29, 2013, in New Orleans. Media Day gets underway at the Mercedes-Benz Superdome the site of this year's Superbowl between the San Francisco 49ers and the Baltimore Ravens in New Orleans, La. on Tues. Jan. 29, 2013. Michael Crabtree answers questions from the press as The 49ers attended media day at the Super Dome in New Orleans, La., on Tuesday, January 29, 2013, as part of the Super Bowl festivities. San Francisco 49ers quarterback Colin Kaepernick answers reporters questions during media day for the NFL Super Bowl XLVII football game Tuesday, Jan. 29, 2013, in New Orleans. Randy Moss of the San Francisco 49ers answers questions from the media during Super Bowl XLVII Media Day ahead of Super Bowl XLVII at the Mercedes-Benz Superdome on January 29, 2013 in New Orleans, Louisiana. Colin Kaepernick smiles as he answers questions from the press as the 49ers attended media day at the Super Dome in New Orleans, La., on Tuesday, January 29, 2013, as part of the Super Bowl festivities. Aldon Smith smiles as he answers a question from the press as the 49ers attended media day at the Super Dome in New Orleans, La., on Tuesday, January 29, 2013, as part of the Super Bowl festivities. Frank Gore speaks to the press as the 49ers attended media day at the Super Dome in New Orleans, La., on Tuesday, January 29, 2013, as part of the Super Bowl festivities. San Francisco 49ers linebacker Aldon Smith smiles as he answers a question during media day for the NFL Super Bowl XLVII football game Tuesday, Jan. 29, 2013, in New Orleans. San Francisco 49ers wide receiver Randy Moss answers reporters questions during media day for the NFL Super Bowl XLVII football game Tuesday, Jan. 29, 2013, in New Orleans. Clark Haggans of the San Francisco 49ers is interviewed by Katherine Webb of 'Inside Edition' during Super Bowl XLVII Media Day ahead of Super Bowl XLVII at the Mercedes-Benz Superdome on January 29, 2013 in New Orleans, Louisiana. Alex Smith #11 , Tramaine Brock #26, Michael Wilhoite #57 and Cam Johnson #50 of the San Francisco 49ers walk onto the field for Super Bowl XLVII Media Day ahead of Super Bowl XLVII at the Mercedes-Benz Superdome on January 29, 2013 in New Orleans, Louisiana. Tavares Gooden of the San Francisco 49ers talks on the phone during Super Bowl XLVII Media Day ahead of Super Bowl XLVII at the Mercedes-Benz Superdome on January 29, 2013 in New Orleans, Louisiana. San Francisco 49ers cornerback Carlos Rogers speaks during media day for the NFL Super Bowl XLVII football game Tuesday, Jan. 29, 2013, in New Orleans. Joe Looney of the San Francisco 49ers kisses his bicep as he is interviewed from the media during Super Bowl XLVII Media Day ahead of Super Bowl XLVII at the Mercedes-Benz Superdome on January 29, 2013 in New Orleans, Louisiana. 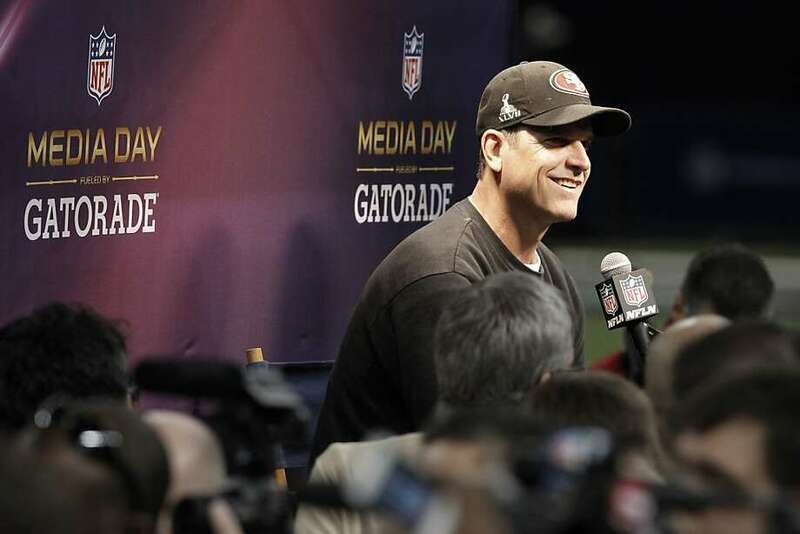 In this image taken with a fisheye lens, San Francisco 49ers head coach Jim Harbaugh speaks during media day for the NFL Super Bowl XLVII football game Tuesday, Jan. 29, 2013, in New Orleans. Michael Crabtree of the San Francisco 49ers answers questions from the media during Super Bowl XLVII Media Day ahead of Super Bowl XLVII at the Mercedes-Benz Superdome on January 29, 2013 in New Orleans, Louisiana. San Francisco 49ers linebacker NaVorro Bowman speaks during media day for the NFL Super Bowl XLVII football game Tuesday, Jan. 29, 2013, in New Orleans. San Francisco 49ers wide receiver Mario Manningham answers a question during media day for the NFL Super Bowl XLVII football game Tuesday, Jan. 29, 2013, in New Orleans. In this photo taken with a fisheye lens, San Francisco 49ers tight end Vernon Davis speaks during media day for the NFL Super Bowl XLVII football game Tuesday, Jan. 29, 2013, in New Orleans. Clark Haggans of the San Francisco 49ers and Katherine Webb of 'Inside Edition' dance during Super Bowl XLVII Media Day ahead of Super Bowl XLVII at the Mercedes-Benz Superdome on January 29, 2013 in New Orleans, Louisiana. San Francisco 49ers linebacker NaVorro Bowman is seen during media day for the NFL Super Bowl XLVII football game Tuesday, Jan. 29, 2013, in New Orleans. Alex Smith of the San Francisco 49ers answers questions from the media during Super Bowl XLVII Media Day ahead of Super Bowl XLVII at the Mercedes-Benz Superdome on January 29, 2013 in New Orleans, Louisiana. San Francisco 49ers safety Dashon Goldson answers questions during media day for the NFL Super Bowl XLVII football game Tuesday, Jan. 29, 2013, in New Orleans. San Francisco 49ers quarterback Colin Kaepernick smiles as the team sets up for a photo during media day for the NFL Super Bowl XLVII football game Tuesday, Jan. 29, 2013, in New Orleans. Katherine Webb of 'Inside Edition' smiles on the field during Super Bowl XLVII Media Day ahead of Super Bowl XLVII at the Mercedes-Benz Superdome on January 29, 2013 in New Orleans, Louisiana. San Francisco 49ers quarterback Colin Kaepernick (7) watches as Ricardo Lockette does an impersonation during media day for the NFL Super Bowl XLVII football game Tuesday, Jan. 29, 2013, in New Orleans. San Francisco 49ers players line up for a team photo during media day for the NFL Super Bowl XLVII football game Tuesday, Jan. 29, 2013, in New Orleans. Members of the San Francisco 49ers football team are interviewed by reporters during media day for the NFL Super Bowl XLVII football game Tuesday, Jan. 29, 2013, in New Orleans. San Francisco 49ers wide receiver Randy Moss wears multiple hats during media day for the NFL Super Bowl XLVII football game Tuesday, Jan. 29, 2013, in New Orleans. Frank Gore answers questions from the press as the 49ers attended media day at the Super Dome in New Orleans, La., on Tuesday, January 29, 2013, as part of the Super Bowl festivities.